The Dining Safety Alliance is grateful to our Sponsors. Their generosity will improve food safety. Does your company have a new or unique product or service? How do you objectively, and in an unbiased way, ‘get the word out’ ? Help increase public awareness of excellent restaurants and tell restaurants about your company at the same time. Your Company’s donation to the Dining Safety Alliance Not-For-Profit will make a difference in Food Safety! 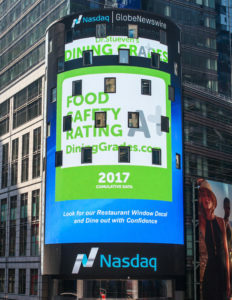 The Dining Safety Alliance sponsor funded window decal program was featured in Times Square in 2017. Thousands of restaurants in the 25 major metropolitan USA cities were sent sponsor or donor funded window decals. 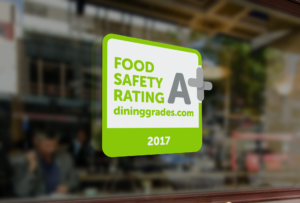 The restaurants earning the window decals had an excellent 36 month food safety rating record. Every year we identify these high achieving establishments. To date we have over 4 million inspections and over a million food establishments from the USA, Canada and the UK. Once the ‘best of the best’ restaurants are identified, sponsor funding further supports the cost of the window decal and mailing. Through this sponsor funded initiative, we are collectively rewarding restaurants that have excellent food safety ratings and and at the same time introducing the sponsor. These restaurants of excellence are likely early adopters of new or improved technology and services. DiningSafetyAlliance cultivates the opportunity to introduce ‘best of class’ strategic partners offering new and improved products and services. This is an unparalleled opportunity for a company to sponsor a state, region or municipality that overlaps with its marketing strategy! Share your unique product or service. We are constantly searching for ‘best in class’ hospitality products and services. When we find them, we are honored to write about those products or services in an objective way in a series of blog posts. Our blog is shared with hospitality leadership at a corporate level and with independent restaurants through email and social media. Our strategy is to develop a compilation of the ‘best of class’ products or services for early industry adopters. If your company has a product or service that you believe could benefit from this strategy please contact us. Becoming a Sponsor serves the restaurant industry and its guests. Corporate Sponsors are prominently recognized on our website. 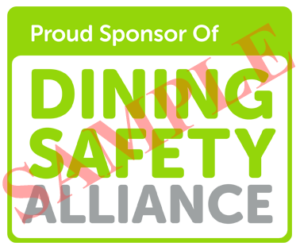 In addition, Sponsors are offered the Dining Safety Alliance logo to proudly display on any Sponsor promotional materials. Being recognized as an organization that supports food safety makes a strong statement of commitment to consumer health and the food safety image within the hospitality industry. We Appreciate our Sponsors Who Share our Passion! Tell us how your company would like to be involved.